Dr Olivia Faull, winner of the 2016 Taylor and Francis Commonwealth Scholar Best Journal Article Prize, was presented with her award at a recent event at the Wellcome Trust in London, UK. 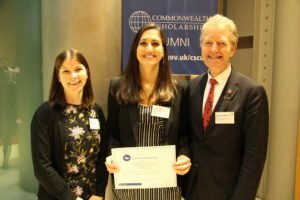 Olivia received her award from Richard Middleton, Chair of the CSC, and Elizabeth Walker, Publisher at Routledge, Taylor and Francis Group – sponsors of the awards since their inception in 2012. Olivia, a 2012 Commonwealth Scholar from New Zealand, won the Best Journal Article Prize 2016, for her article ‘Conditioned respiratory threat in the subdivisions of the human periaqueductal gray’, published in eLife in February 2016. She studied for a DPhil in Clinical Neuroscience at the University of Oxford. The prize presentation was part of a seminar hosted by the CSC on ‘Doctorates and development: Global challenges and research capacity building’, attended by funders and practitioners of British research, including Commonwealth Scholarship supervisors and advisers, as well as representatives from doctoral training centres and Research Councils UK. Applications for the 2017 Taylor and Francis Commonwealth Scholar Best Journal Article Prize will open on 16 January 2017. The prize comprises a cash prize of £1,500 and a year’s personal subscription to a Taylor & Francis journal of the winner’s choice.